Today is the feast of St. Edward the Confessor and "Godfather Day" in our house. Both of the girl's godfathers share a birthday today. How uncanny is that? One of them is even named for St. Edward because that was the tradition in his family. Good thing he wasn't born a day or two late! "Happy Birthday, Uncle Burke" who will have another sweet new baby to hold any day now and "Happy Birthday, Tio Eddie" who is proud papa to precious Little O who is now a year and a half old and is walking, talking, running and playing! She is their miracle child! 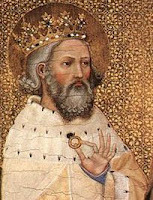 Many legends sprang up about Edward the Confessor both during his lifetime and after his death. One that has stood the test of time happened towards the end of his life. Legend has it that Edward was riding to a ceremony at a chapel dedicated to St John the Evangelist in Essex when a beggar asked for alms. Edward had no money with him so he took off his ring and handed it to the poor man instead. A few years later two English pilgrims were travelling through the Holy Land and became stranded. They were helped by an old man who told them he was St John the Evangelist. He was carrying the ring Edward had given to the beggar some years previously. He asked the pilgrims to return it to the king telling him that in six months he would meet St John in heaven. Happy Godfathers Day to your family! Thank you again for doing this page. Edward has been looking forward to his name day for several weeks!